I have no idea how many times but i have changed the scan like 25 times. I mean i had this scan, and the colros were more yellow, and stuff. So, i tried recoloring it, and MANY times it didnt work out. SO, i overlayed the scan LIKE SOO MANY times, and right now there are probobly around 3 scans in one place XD lol. I AM VERY SORRY IF THE COLORS STILL DONT MATCH! ! ! Then the bg took me about 3 to 4 hours. Not couning the time when i went to eat ^^ lol! Anyways, PLEASE PLEASE PLEASE! Let me know what ya all think, kay! Like already been said ill try changing MOST OF ALL THAT I CAN! if you guys find something that might need some more help, really tell me! :) Cos, i know the scan is liek HORRIBLE looking, but still thanks for viewing XD lol! Well, Please ENJOY! and what do you think? The background looks very pretty and rosey :D Lovely! Wow, I like that background very much, it's beautiful. nice wallpaper, the bg you made looks great, i like the colour and the effects. the chara fits in well too. Such a wonderful scene on your wall. I love the background. Great work on the clouds and the moon. The birds are very nice, like them a lot. The scan is extracted perfect and interact great with the hole wall. Nice tone in tone work. Love your works more and more. oh I really like those clouds. they are so pretty. and well the scan doesn't look horriable and the colors do match it's just something is a bit different of the look of the scan compared to the background. I don't know but I still think it looks really cool! And very pretty! Great job! Wow~ pretty red theme! ^^ The background is awesome~ ^_^ Keep it up! u made the bg from scrach?! u are scarry~! 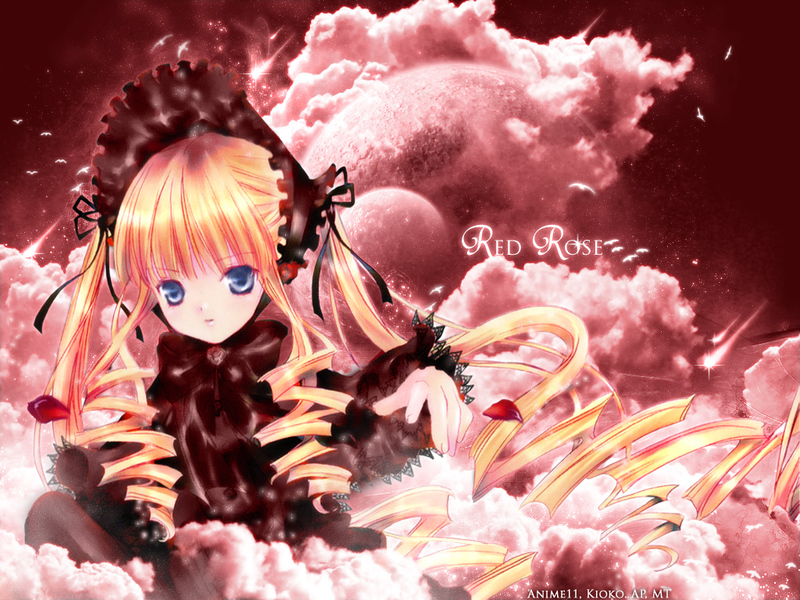 Good wall,Shinku look very good here...i like her hair.The background is amazing..good work. ara...Shinku ne.....ara....red rose, i love roses lots, the wallie is just amazing....it's so nice, great work, i love the red coloris so nice, great design and wallie....to ma favs. Like the artwork. Thanks for sharing this.